Surrounded by engrossing stories of Sufi saints, tales of emperors & poets is none than Delhi’s well-known village named after Hazrat Nizamuddin Auliya, well known Sufi saint. At the epicenter of the area is Dargah of Nizamuddin, set in a medieval ambience of narrow alleys and bazaars. Because of its association with the saint, the area became a popular site for burials – for emperors, saints, nobility, royalty, warriors and poets alike. Located exactly opposite Humayun's Tomb is Nizamuddin Dargah. It is the mausoleum of Nizamuddin Auliya, one of the best known Sufi saints. 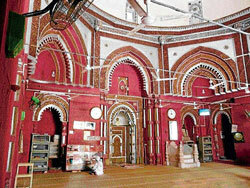 This dargah is not only revered by Muslims but includes visitors from other faiths, including Hindus. Built by Muhammad Bin-Tughlaq of Delhi Sultanate this mausoleum also includes the tombs of Amir Khusrau, one of the eminent Muslim poets and Jahanara Begum along with the tomb of Inayat Khan located within the complex. Today, the dargah is surrounded by a bustling marketplace complex, surrounded by a colony of staunch Muslims. According to legend, Hazrat Nizamuddin Auliya was chiefly responsible for spreading Sufism to every corner of India. Born in 1236 and known as Sheikh Nizamuddin, he came to Delhi along with his mother and became a disciple of Sheikh Farid of Shakargunj. It is often said that Hazrat Nizamuddin was the first to predict that the city of Tughlaqabad which was the capital of Delhi Sultanate would never prosper to glory and Ghias-ud-din Tughlaq would never return to Delhi to rule the Sultanate. His prediction came true and since then it was believed that all his predictions would come true. He died in 1325 and laid to rest in this mausoleum constructed by Muhammad Bin-Tughlaq who decorated it with white marbles inscriptions from the Quran. Qawwalis at the Nizamuddin Dargah are very well-known and boast of their own loyal following. The colony around is named after the saint and is divided into two parts along Mathura Road - Nizamuddin West where the Dargah step and a lively market dominated by Muslim vendors is located, and Nizamuddin East, an upper-class residential area situated between Humayun's Tomb and Nizamuddin Railway Station. The other important monuments in this heritage area include Chausath Khamba, Mirza Ghalib's tomb, Barakhamba, Blue Gumbad at the roundabout and Lal Mahal. But while the area bears such a rich history, today the area reels under the influence of drug abuse, crime and poverty all of which remain a big problem for the neighbourhood.